Leeds United head coach Garry Monk was understandably delighted after seeing his side make it eight wins from their last 10 league games with a 4-1 win in their Boxing Day game away to 10-man Preston North End. Three first half goals put the Whites in control and Preston’s comeback hopes were effectively ended when they had their former Leeds striker Jermaine Beckford sent-off just three minutes after coming on as substitute. The biggest win under Monk kept United in fifth place ahead of their trip to Aston Villa on Thursday evening. After the game he said: “It was a great Christmas present for our fans. We talked about that as a group, we wanted to give them something to be happy about. “It was always going to be a difficult place to come, especially physically. They put a lot of physicality into their game. We worked a lot in the week on dealing with certain situations and I thought we did it very well. “The only disappointment was the one time we lost concentration we conceded a goal. That’s the only disappointment from the day, but we managed to regain a two-goal lead into half-time. “We controlled our game very well and came away with a deserved three points. “All four goals were excellent and had we been a little bit more greedy we could have scored some more. We deserved those goals and played well in those moments. “We controlled it from start to finish. They had a few moments where we had to defend very well and we did. “I still think we could have done even better, but I can’t be too critical. I appreciated the effort and focus of the player today on both sides of the game. “We’re still improving and you can see step by step and every time they go on the pitch they get more confident and are learning from their mistakes. Monk left out Ronaldo Vieira, bringing Liam Bridcutt back into midfield while Gaetano Berardi came in at left-back for the injured Charlie Taylor. 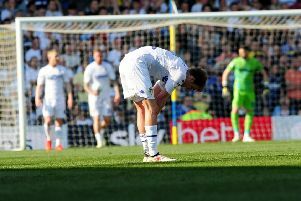 Striker Chris Wood was on the bench after his injury and Pablo Hernandez was also alongside him after his longer spell on the sidelines. After a quiet opening the game exploded into life with four goals in 14 minutes. The first of them saw Leeds go ahead when Pontus Jansson met Stuart Dallas’s free-kick with a looping header and Kemar Roofe followed it in to get the final touch from close range. Rob Green made a good save to deny Callum Robinson, but United doubled their lead soon after when Hadi Sacko combined well with Roofe to race through to score with a crisp strike into the roof of the net. Preston hit back immediately as a cross was knocked down to Marnick Vermijl just inside the box and he fired a shot past Green. However, the goals kept coming and Leeds made it 3-1 just past the half-hour when Souleymane Doukara got round his marker in the box and saw his near post shot trickle over the line after keeper Chris Maxwell got a hand on the ball without being able to keep it out. There could have been another goal at the other end, but Daniel Johnson smashed a shot well over. A header from Makienok then went wide before Roofe shot over at the other end following a good run by Bridcutt. Preston started the second half strongly, but United’s defence stood firm and when it was breached Green made a brave save at the feet of Alan Browne. Beckford was thrown on by Preston boss Simon Grayson, but his impact was not the required one as he was red carded within three minutes for kicking out at Kyle Bartley while on the floor. With an extra man Leeds now saw out the remainder comfortably and put the icing on the cake with a fourth goal in the 88th minute when their substitutes combined well, Wood sending Hernandez through to finish calmly. Preston: Maxwell, Baptiste, Clarke, Huntington, Cunningham, Vermijl, Pearson, Browne, Johnson (Doyle 75), Robinson (Beckford 66, sent-off 69)). Makienok (Hugill 66). Leeds: Green, Ayling, Bartley, Jansson, Berardi, Phillips, Bridcutt, Sacko (Hernandez 54), Roofe (Antonsson 80), Dallas, Doukara (Wood 75).